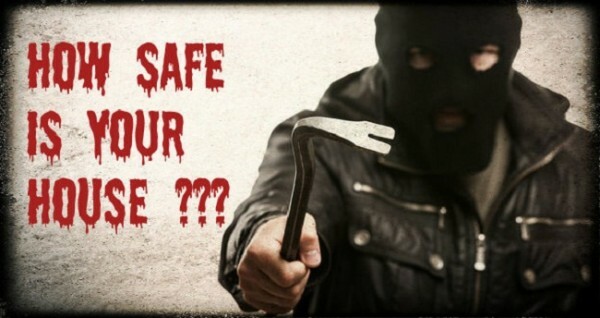 Your home should be your sanctuary, but is it safe? Burglaries are one of the most common crimes, with one burglary every 15 seconds in North America. However, we can all take steps to improve our home safety. The typical thief will spend only one minute—just 60 seconds—trying to break in to a home. Having a secure door could improve your home security, in addition to making your home more durable. For example, solid core or metals doors are very secure, and these doors come in a variety of attractive styles, which in addition to improving security, also increase curb appeal. If you’re concerned about break-ins, don’t choose doors with glass panels unless you also have a security film over the glass. If the panel is close to the lock, a burglar could smash the glass unlock the door from the outside. Deadbolt locks are the most secure, but make sure the horizontal bolt ismore than 1 inch long. Many break-ins occur when the burglar kicks the plate which holds the bolt or latch in place. Install a high-security metal strike plate, attached with 3-inch screws. Make sure all outside doors are equally secure—including the door from your garage. Never hide a spare key to your home. This is a surprisingly common practice—and is known to burglars. That concealed hiding place might not be so secure, so leave your spare key with a friend instead. Windows are of course a common target for burglars. Make sure they have secure locks, and have stops installed which restricts their opening to 6 inches or so. Windows with tempered glass are stronger, and windows can also be made stronger with an impact-resistant film. Vinyl windows are safer and more energy efficient when compared to any other type of window. If you have your garage door opener in your car, always make sure your car is parked securely in your garage. Home security systems may prevent your home being targeted, and in the event of a break-in, could increase the chance the burglar is apprehended. Some home security systems include glass-break sensors, or shock wave sensors, which will activate if a burglar is attempting to kick open your door. Alarm all windows and doors which could provide access. Make sure the yard sign is visible, and use the window decals. Your home is a more tempting target if it looks unoccupied. Drapes which are closed all day are a sign that no one is home. If you go on vacation, install automatic timers to close drapes and turn lights on. Don’t let mail or newspapers pile up. Informing your neighbours you’ll be away means they can be on the look out for any potential problems. Deborah Salinas is my name and I am a contented homemaker who works from dawn to dusk for the well being of my family. I love everything which makes my home look elegant and stylish. I am an absolute family person and I try my best in bringing down heaven within the four walls of my home. I live with my husband and two handsome sons in Toronto.